This cemetery is near the old community of Higgins. It is presently in or near Lowry Crossing. The deed for the cemetery is listed in Vol 9, p 96, for a plot 68 yds x 68 yds. Approximately that area is left uncleared. At one time there was a fence around the cemetery. There are bits of the fence and the posts. There is evidence that cows have been in the cemetery in the past. At the time of my visit there were cows in the first field. One stone remains in the cemetery. 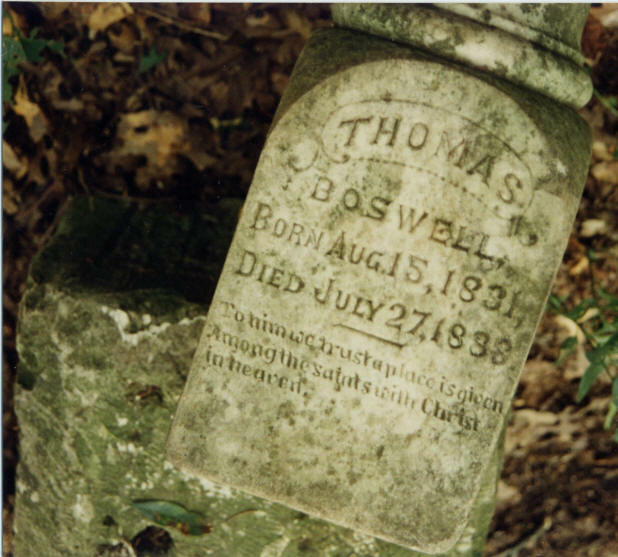 It is for Thomas Boswell, born August 15, 1831, died July 27, 1889, and reads: "To him we trust a place is given, Among the saints with Christ in heaven." It has an accompanying footstone. The stone has fallen over. There are two other stones that have no writing on them. It is unclear if they are headstones or footstones. There are also several bois d'arc markers. According to COLLIN COUNTY CEMETERY INSCRIPTIONS I, John Kennedy, Vic Kennedy and baby girl, Virginia Kennedy Wallace and baby girl are all buried here. Their map mistakenly shows the cemetery on the north side of CR 400. This cemetery is totally neglected and has been for years. The trees are so thick that there is not much growth under them in the cemetery. There are Kennedy relatives around that live in Princeton. As the crow flies, this cemetery is probably about ¼ mile northeast of the Higgins Cemetery and ½ mile east of the Wilson Chapel Cemetery. This is all private property and permission should be obtained before entering the land. At present Roy McGill is leasing the land. The cemetery will be very hard to find without assistance and will be impossible to reach if the ground is wet. CR 400 is a dirt road, not a white rock road. It is not travel-able when it is wet. Also you have to cross a creek that can be quite high in rainy weather. This cemetery has a Historic Texas Cemetery designation.